Hey, today I thought I would do a review of a product that I have been loving all of this year, and that is the Urban Decay Naked 2 Palette. I got this last year off my Mum and Dad and since then I have been wearing it nearly everyday, I am so happy I got this palette, as I can do many different looks with it. 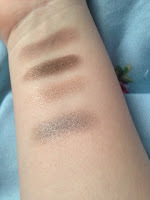 Before I asked for it I did a lot of research on it, as I wanted to make sure I had picked the right palette, and that I would wear it more than once or twice, so this is one of the main reason I am doing this post, so if you want it for Christmas, or you are thinking about buying it yourself you can see what all the eye shadows look like, and what I think are the best shades. I really liked the packaging of this palette, of course the Naked 3 packaging is better but, though I don't have the Naked Palette, I still think from pictures I have seen of it the packaging for this palette is a lot better. Also, because of the material it is made of it is super easy to clean it if any make up spills on it. 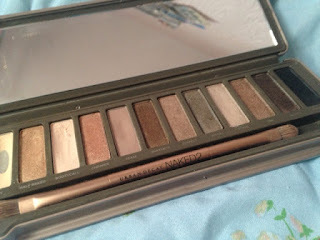 There are twelve different eye shadows in this palette, varying from soft, light shades to darker shades.Compared to the Naked Palette the Naked 2 Palette has more cooler shades, more taupe shades, than brozney and golds shades. 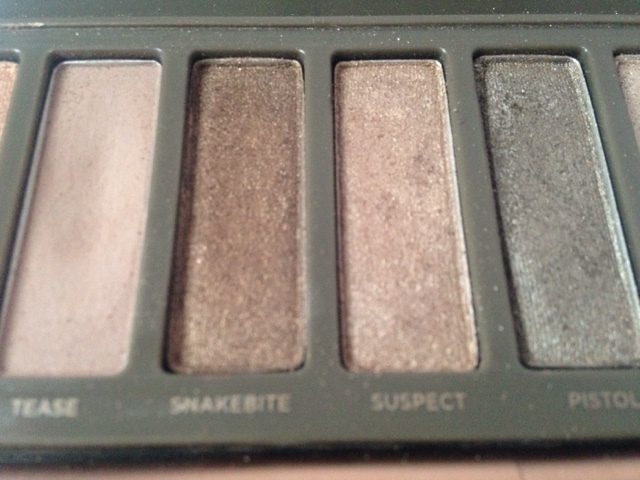 The eye shadows are Foxy, Half Baked, Bootycall, Chopper, Tease, Snakebite, Suspect, Pistol, Verve, YDK, Busted and Blackout. Foxy is one of the matte shades in the palette, and also one of my favourites, it is a lovely creamy shade. For me this is perfect for a base shade. 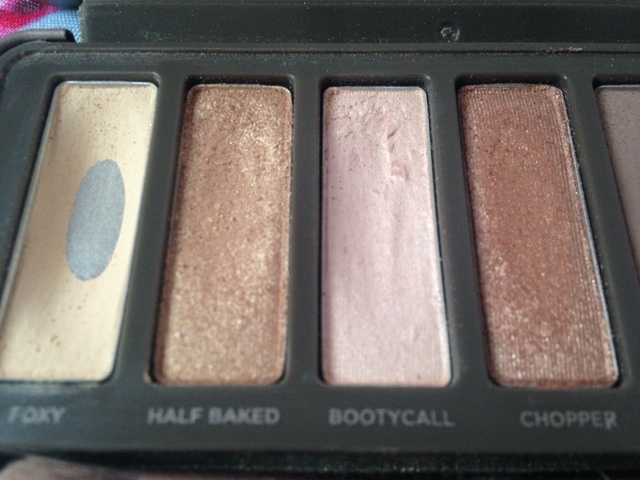 Half Baked is one of the shades that featured in the Naked Palette. It is a lovely bronze/gold shimmery shade. This looks perfect with Foxy, just for a simple eye look. 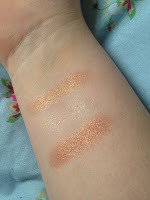 This again is another one of my favourite shades in the palette, it is a lovely cream shimmer shade. For me this looks perfect on the inner corner of your eyes, as it makes them look a lot bigger and more awake. This is a lovely copper shade, with gold micro-glitter. This eye shadow is another one that I think look so nice with Foxy. At first, this was a shade I was going to stay away from, just as it was a brown shade, and though it wasn't a dark shade, I thought it would look awful on me. However, after a while, I became brave and wore it... and I loved it. I again like to use this with Foxy, apply this into my crease, what really makes a lovely natural look. Another shade I wanted to stay away from, because of how dark it looked, and still to this day I don't wear it too often. Though it looks perfect over the top of Tease. This shade is a brown with dark bronze shimmers, and looks so nice. 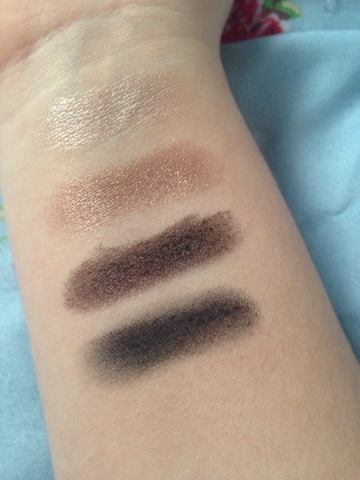 This is more of a neutral brown shade, it a lot lighter than Snakebite. It again has some shimmer in it, more gold or silver shimmer. Again, this is another shade that I haven't worn too much, maybe once or twice. 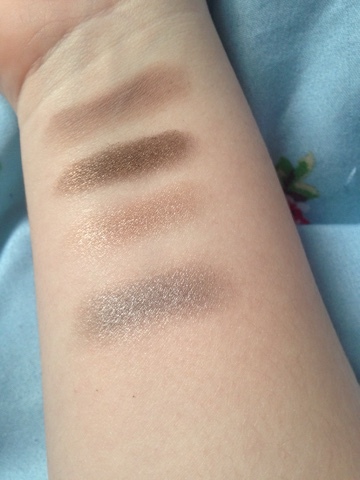 It is a really pretty eye shadow, a mixture between grey and brown, with some shimmer, and I do really want to wear it, though I think it would not look nice on me. This is such a pretty shade, it is a pearly shade. I personally think it is a bit like Bootycall, but more shimmery. I really like this shadow and I haven't used it that much, so I think I am going to wear it a bit more. YDK is a shade I started wearing a lot in the summer, and still wear it today. It is such a pretty cool bronze shimmer, and can be used in eye look with different eye shadows, or on its own, just all over the lid. 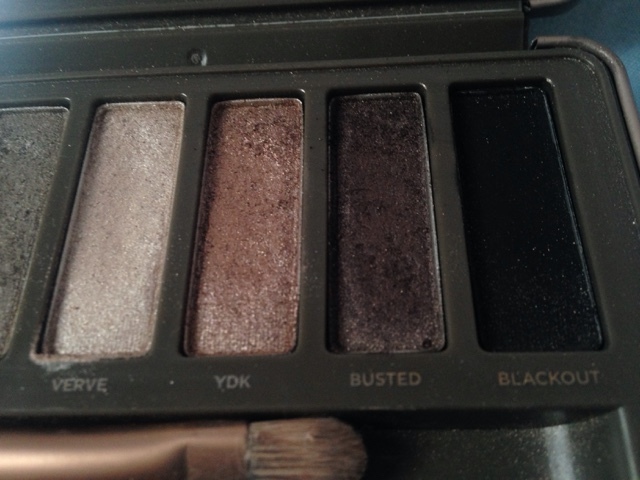 Busted, is an eye shadow I have worn about once, when I went to see McBusted. Though it is such a nice shade, I don't know how I could wear it, it is a plummy brown shade, and as it has red tones, it looks better on people with blue or green eyes, and I have neither of them, my eyes are hazel, so I haven't really worn this shade. This is a simple matte black shade, it is very basic. I believe it has appeared in previous palettes, and it is very pigmented. I haven't really worn this either, I think I have worn it once or twice in the outer corner of my eye, super blended out. I really like this palette, and think it is such a good palette to have, as you can do so many different looks. 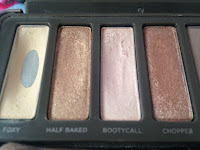 I hope you liked this post, and my review on palette. Also, I am thinking of doing 12 Days of Blogmas, so on the 12 days leading towards Christmas I am think of uploading a post everyday, though I am still a bit uncertain if to or not, comment below if you want me to, and any ideas for posts. If I do it will be starting from next Sunday (13th) and all the way till Christmas Eve (24th). Thank you, I will think about doing the makeup looks with this palette, I highly recommend you buying this palette, it such a good palette, thank you for reading and commenting! Thank you, I personally didn't think the photography was that good, but it means a lot that someone actually liked it! 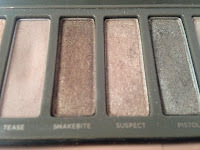 Hope you get the Naked palette, if you do you will have to do a post like this so I know of to get t or not! I am very very jel! 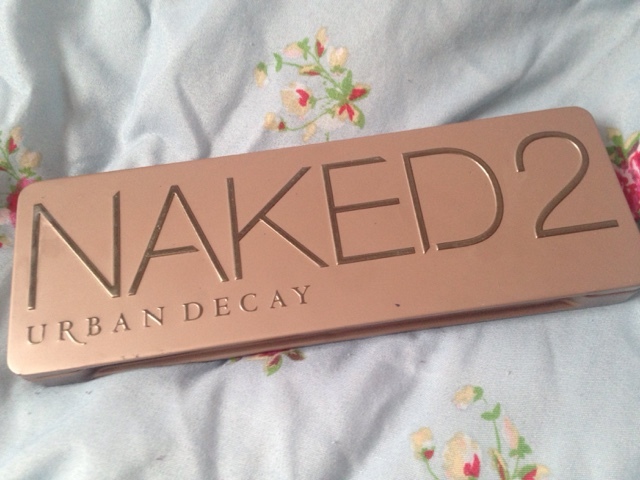 The naked 2 looks perfect but the price is so off putting! I know, it is a lot, I could never buy it for myself, but as a Christmas present if you will use it a lot I think that it okay. Thank you for reading and commenting.